NASA's space shuttle Atlantis launched in May 2000 with a small package tied to the Olympics Summer Games — in 2012. The Olympics officially launch today (July 27) in London, but it was a NASA mission from 12 years ago that first lifted off to space with 2012 Summer Games' memorabilia. Space shuttle Atlantis blasted off on May 19, 2000, on a 10-day mission to the International Space Station. Aboard the orbiter were supplies for the nascent complex, which at the time comprised just two of its eventual 12 modules. The STS-101 mission came a few months before the start of the 2000 Summer Olympics held in Sydney, Australia. To pay tribute to the international nature of the Games, the shuttle's crewmates carried a banner for the Olympics and a replica of the 2000 Sydney Torch. One of the 1,000 Houston 2012 Olympic lapel pins that launched aboard space shuttle Atlantis's STS-101 mission. Houston, (can) we have an Olympics? Every NASA space shuttle mission carried a small pouch of souvenirs, called the Official Flight Kit, or OFK, packed with mementos to thank the NASA employees and outside organizations who helped make the mission possible. The space agency would also sometimes use the OFK to fly items for outreach projects and for groups supporting the local communities around NASA centers, such as the Johnson Space Center in Houston. 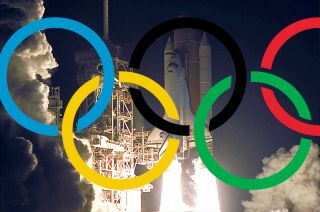 As Atlantis orbited high above the Earth, Houston was in the running to be the U.S. Olympic Committee's bid city to host the 2012 Summer Olympics, competing against New York, San Francisco, and Washington, D.C.-Baltimore. NASA, in support of bringing the Olympics to Houston — home of Mission Control and the U.S. astronaut corps — launched aboard Atlantis 1,000 lapel pins for the Houston 2012 Foundation. The organization described its role as "to identify, package and communicate the reasons why Houston is the best place for the 2012 Olympic Games." The lapel pins were the shape of the space shuttle orbiter with the foundation's stylized Texas flag torch logo at their center. Under the red, white and blue torch was inscribed, "Houston 2012." After Atlantis returned to Earth, the pins, which circled the planet 155 times and traveled 4.1 million miles (7.6 million kilometers), were returned to the Houston 2012 Foundation for distribution to its members and supporters. Many, if not all, of the well-traveled pins were embedded inside acrylic with the inscription, "Flown on Space Shuttle Atlantis, STS-101, May 2000." In the dozen years that have gone by since the "Houston 2012" pins flew in space, at least a dozen of the pins have appeared at public auctions, where they have been sold into private Olympics and space memorabilia collections. A recent example of the 3.25 by 2 by 1 inch (8.3 by 5 by 2.5 centimeters) acrylic-encased pin display sold on eBay for $215 this past May. With the London Games getting underway today, collectors have commented how the flown pins may find renewed interest as an unusual memento from the 2012 Summer Olympics, especially as pin trading is an established tradition at each of the Games. Click through to collectSPACE.com to see an example of the “Houston 2012” lapel pins flown on space shuttle Atlantis in May 2000.